Find the design requests of more than 300 villagers in Animal Crossing: Happy Home Designer with our complete list! Special characters are not included in the list as their requests are always “I’ll leave it up to you!”. Villagers marked with an asterisk are characters obtained through DLC. Thanks to Connor and our lovely commenters below for contributing the vast majority of this data. Agent S Squirrel A superhero training area. Agnes Pig An art museum. Al Gorilla A kid-friendly exercise room. Alfonso Alligator A starry-sky cake dream. Alice Koala A mix of antique pieces. Alli Alligator A mushroom manor. Amelia Eagle An elegant, lofty space. Anabelle Anteater A cosmopolitan yard. Anchovy Bird A brand-new hat shop. Angus Bull A salty seaside shack. Anicotti Mouse A pizza-party space. Ankha Cat An ancient tomb. Annalisa Anteater A zen restaurant. Annalise Horse A stained-glass tearoom. Antonio Anteater A place decorated simply. Apollo Eagle A celebration of tallness. Apple Hamster An apple-inspired room. Astrid Kangaroo A playful rock studio. Aurora Penguin A flower shop. Ava Chicken A professional kitchen. Avery Eagle A room full of fossils. Axel Elephant A dentist's office. Baabara Sheep A ballet studio. Bam Deer A field-trip atmosphere. Bangle Tiger An animal-print showcase. Barold Cub A room for stew. Beardo Bear A cultivated garden. Beau Deer A self-indulgent picnic spot. Becky Chicken A classical conservatory. Bella Mouse A place to practice singing. Benedict Chicken A journey through space. Benjamin Dog A life of self-sufficiency. Bertha Hippo A ton of baskets. Bettina Mouse A famous patisserie. Bianca Tiger A snowman's life. Biff Hippo A sci-fi space. Big Top Elephant A superhero cafeteria. Bill Duck A summer house. Blaire Squirrel A classy hotel. Blanche Ostrich A traditional tearoom. Bluebear Cub A supersweet bakery. Bob Cat A floral atmosphere. Bonbon Rabbit the "it" house. Bones Dog A second childhood. Boomer Penguin A captain's cockpit. Boone Gorilla A desert paradise. Broccolo Mouse A bug house. Bree Mouse A tidied-up room. Broffina Chicken A bus station. Bruce Deer A mah-jongg parlor. Bubbles Hippo An indoor beach. Buck Horse A locker room. Bunnie Rabbit A perpetual birthday party. Butch Dog A cool dog park. Cally Squirrel A nice place to do laundry. Camofrog Frog A nature sanctuary. Canberra Koala An international restaurant. Carmen Rabbit A chocolate overload. Caroline Squirrel A rustic ranch house. Carrie Kangaroo A garden for kids to play in. Celia Eagle A royal chamber. Cesar Gorilla A construction site. Chadder Mouse A cheesy place to nibble. Charlise Bear A flower showcase. Cheri Cub A fruity room for juicing. Chester Cub A bamboo playroom. Chevre Goat A high-security bank vault. Chief Wolf A cool garage. Chops Pig A king's chamber. Chow Bear A humble abode. Chrissy Rabbit A delightfully dotted room. Claude* Rabbit A pro-Nintendo game shop. Claudia Tiger A cool coffee shop. Clay Hamster A spooky haunted house. Clyde Horse A fresh and fruity room. Coach Bull A gym for athletic contests. Cobb Pig A secret research lab. Coco Rabbit An ancient-artifacts exhibit. 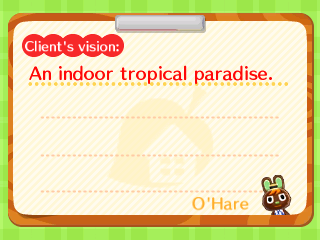 Cole Rabbit A tropical resort. Colton Horse A noble living space. Cookie Dog A room fit for a princess. Cousteau Frog A restaurant for exotic food. Cranston Ostrich A place to grow rice. Croque Frog A noodle shop. Cube Penguin An eco-friendly factory. Curlos Sheep A Toy Day celebration. Curly Pig A game-development studio. Curt Bear A glory-days trophy room. Cyrano Anteater An odd-numbers gallery. Daisy Dog A magnet for Santa. Deena Duck A home gym. Deirdre Deer An autumnal atmosphere. Del Alligator A shrine to seafaring. Deli Monkey A room scented by curry. Derwin Duck A private study space. Diana Deer A tranquil sanctuary. Diva Frog A place with good vibes. Dizzy Elephant A super-fun play space! Doc Rabbit A fun place for books. Dora Mouse An herb garden. Dotty Rabbit A two-tone room. Drago Alligator A mochi delight. Drake Duck A break room with a view. Drift Frog A hospital lobby. Ed Horse A spontaneous dinner party. Egbert Chicken An even-numbered room. Elise Monkey An eyewear showroom. Elmer Horse A sock shop for sock lovers. Eloise Elephant A not to all things green. Elvis Lion A royal palace. Erik Deer A cozy mountain cottage. Eugene Koala A space for self-reflection. Eunice Sheep A toast-warm winter room. Fang Wolf A chair showroom. Fauna Deer A home concert hall. Felicity Cat A television-show set. Felyne* Cat A place for Felyne. Filbert Squirrel A bounty of balloons. Filly* Horse A 24-hour shop. Flip Monkey An ancient bathhouse. Flo Penguin A place to practice guitar. Flora Ostrich A place that's all pink. Flurry Hamster A winter wonderland. Francine Rabbit A Chrissy shrine. Frank Eagle A miniatures museum. Freckles Duck A fishy room under the sea. Freya Wolf A pro chef's kitchen. Friga Penguin A classic, royal room. Frita Sheep A fast-food restaurant. Frobert Frog A shrine to all things Gracie. Fuchsia Deer A hangout for li'l rebels. Gabi Rabbit A room with a piano. Gala Pig The town bank. Gaston Rabbit A backwater clinic. Gayle Alligator A home with heart. Genji Rabbit A haunted house. Gigi Frog A space for a classy gal. Gladys Ostrich A peaceful zen garden. Gloria Duck An alpine homage. Goose Chicken A room for waking up early. Goldie Dog A forest of books. Graham Hamster A start-up company. Greta Mouse A hot-springs spa. Grizzly Bear An opulent oil tycoon's hall. Groucho Bear A farming homestead. Gruff Goat A classic barbershop. Gwen Penguin A day spa. Hamlet Hamster A soccer arena. Hamphrey Hamster A smoked-foods showcase. Hans Gorilla An indoor ski run. Harry Hippo A slop-tastic pad. Hazel Squirrel A comic artist's workshop. Henry Frog A contemplative train trip. Hippeux Hippo An artist's studio. Hopper Penguin A dharma dream. Hugh Pig Eat, drink, sleep. Repeat. Iggly Penguin A winter-sports paradise. Jacques Bird A hip music room. Jambette Frog A dressing room. Jay Bird A bowling alley. Jeremiah Frog A blue room, top to bottom. Jitters Bird A soccer arena. Joey Duck A spa featuring cool milk. Julian Horse A mythical home. Katt Cat A gathering of Katts. Keaton Eagle A seaside breakfast nook. Ken Chicken A ninja hideout. Kid Cat Cat A superhero base. Kidd Goat A photography studio. Kiki Cat A replica aquarium. Kitt Kangaroo An electronic showroom. Kitty Cat A sidewalk bistro. Klaus Bear An ancient bathhouse. Knox Chicken A battle enthusiast's abode. Kody Cub A blue training space. Kyle Wolf A piped room. Leonardo Tiger A sports arena. Lily Frog A zen space with moist air. Limberg Mouse A self-sustaining sanctuary. Lionel Lion A guest bathroom or two. Lobo Wolf A nostalgic throwback. Lolly Cat A lecture hall. Lopez Deer A stylish space. Louie* Gorilla A 30th-anniversary party! Lucha Bird A pro-wrestling arena. Lucky Dog A lucky room for a lucky life. Lucy Pig A creepy-looking dollhouse. Lyman Koala A veggie palace. Mac Dog A summer campsite. Maelle Duck A high-end fashion boutique. Mallary Duck A harvest-centric home. Maple Cub A plush bear den. Marcel Dog A zen-like washroom. Marcie Kangaroo A nursery school. Margie Elephant A place full of clothes. Marina Octopus An underwater fantasy land. Marshal Squirrel A world-famous cafe. Mathilda Kangaroo A sustainable space. Melba Koala A scene from a fairy tale. Merengue Rhino A candy house. Merry Cat An artsy room for sketching. Midge Bird Midge's hair salon. Mint Squirrel An ice-cream shop. Mira Rabbit A futuristic space. Miranda Duck A stay-healthy home. Mitzi Cat A café with round, zen items. Moe Cat A magician's hideaway. Molly Duck A publishing house. Monique Cat A room with stained glass. Monty Monkey A monkey mansion. Moose Mouse A spot to play hoops. Mott Lion A physicist's office. Muffy Sheep An ornately decorated room. Nan Goat A zodiac-figurine stand. Nana Monkey A serene park to lunch in. Naomi Cow An art gallery. Nate Bear A cardboard life. Nibbles Squirrel A nice, quiet study space. O'Hare Rabbit An indoor tropical paradise. Octavian Octopus A squid-showdown citadel. Olaf Anteater A million-Bell view. Olivia Cat A piano conservatory. Opal Elephant A serene spa. Ozzie Koala A trip to the school nurse. Pancetti Pig A sleep sanctuary. Pango Anteater A posh, private day spa. Papi Horse A wood-inspired abode. Pashmina Goat A gorgeous, rococo room. Pate Duck A stylish Internet café. Patty Cow An everyday cookout. Paula Bear A karaoke parlor. Peaches Horse An oasis of round furniture. Peanut Squirrel The land of the free. Pecan Squirrel A chic and relaxed room. Peewee Gorilla A fancy gym. Peggy Pig A mermaid's life. Pekoe Cub An exotic resort. Penelope Mouse A nonstop wedding party. Phil Ostrich A personal micro cosmos. Phoebe Ostrich A fiery hangout. Pierce Eagle A classy training room. Pietro Sheep A dreamland for Pietro. Pinky Bear A feng-shui flow. Pippy Rabbit A striped room. Pompom Duck A splashy, modern garden. Poncho Cub A wild west space. Poppy Squirrel A pet-friendly paradise. Portia Dog A tribute to Festivale. Prince Frog A barbershop for beards. Puck Penguin A chilly room for icy sports. Puddles Frog An adorable, pink room. Pudge Cub A nouveau-riche retreat. Punchy Cat A room for entertaining cats. Purrl Cat A cozy kotatsu cottage. Queenie Ostrich A world of black and white. Quillson Duck A recording studio. Renée Rhino A vacant lot. Rhonda Rhino A relaxing island getaway. Ricky Squirrel A chiropractic office. Roald Penguin A room fit for a racer. Robin Bird A country teahouse. Rocco Hippo A danger-filled zone. Rocket Gorilla A superhero hideout. Rod Mouse A pirate hangout. Rodeo Bull A milk factory. Rodney Hamster A production studio. Rolf Tiger A camping collection. Rooney Kangaroo A boxing gym. Rory Lion An ocean-themed space. Roscoe Horse A black and white bastion. Rosie Cat An office/studio for a star. Rowan Tiger A treasure shop. Ruby Rabbit A room for moon gazing. Rudy Cat A chess room. Sally Squirrel A green space with flowers. Samson Mouse A room with treasure. Savannah Horse A home with natural beauty. Scoot Duck A house with a pool. Shari Monkey A bed of nonwilting flowers. Sheldon Squirrel An all-you-can-game room. Shep Dog A life on the streets. Simon Monkey A banana bungalow. Skye Wolf An art studio. Snake Rabbit A ninja mansion. Soleil Hamster A summery stronghold. Sparro Bird A place to retire. Spork Pig A school cafeteria. Sprinkle Penguin A frozen world to play in. Static Squirrel A game haven. Sterling Eagle An outer-space space. Stinky Cat A pro-wrestling ring. Stitches Cub A colorful toy box. Sydney Koala An office with a phone. Sylvia Kangaroo A place with a pool. T-Bone Bull A fire-filled hot spot. Tabby Cat An old, abandoned hospital. Tammi Monkey A place to stay hydrated. Tammy Cub A Halloween-themed place. Tangy Cat A deliciously fruity room. Tank Rhino A place to play board games. Teddy Bear An awards podium. Tex Penguin A rehearsal room for a band. Tia Elephant A space fit for a tea party. Tiffany Rabbit A gorgeous celebrity home. Timbra Sheep A stargazer's dream. Tipper Cow A dairy farm. Tom Cat A fighter's gym. Truffles Pig A constant quiz show. Tucker Elephant A fresh start. Tutu Bear A cool place to chill out. Twiggy Bird Surrounded by souvenirs. Velma Goat A fully outfitted classroom. Vesta Sheep A place with a fireplace. Vic Bull A pirate's refuge. Victoria Horse A lucky yellow room. Violet Gorilla A homey little restaurant. Vladimir Cub A way below ground. Walker Dog A dream room...for a bike. Walt Kangaroo A shrine to samurai. Wart Jr Frog A bonsai shrine. Wendy Sheep A place to spin records. Whitney Wolf A home bathed in white. Willow Sheep An alpine-themed room. Winnie Horse A stable for horses. Wolfgang Wolf A monument to rock. Zell Deer A themed hotel. Zucker Octopus An indoor street fair.